Aaaaaand we're back! Good grief. Many apologies to anyone who was trying to log on here in the last few days. We were having major technical difficulties. (And by "we" I mean my sainted husband and me....because things got so bad that I had to enlist his help.) I had briefly switched over to Wordpress when I bought my domain name, but then wanted to switch back to Blogger (because you really need to be able to purchase the premium version of Wordpress if you want to do anything worth doing), and now I'm finally back! Deep sigh of relief. I'm still excited to have a new domain name (http://mydomesticmonastery.com) but it feels so good to be back home in Blogger for now. Anyway, that was a lengthy preamble, but how would you like some reading for the weekend? Before I forget...the vlog has been filmed! I'm just working on some of the technical aspects, and then it'll be posted (hopefully sometime next week). I'm so excited! The first episode is about building your library on a small budget (a must for any grad student family!). Pope Francis says some face-palm comments that get picked up by the media, but I'm always even more amazed by the solidness of what doesn't get picked up by the media. For example, his reaffirmation that a Catholic couple MUST be open to having children at some point during their marriage, in order for the marriage to be valid. I have a lot of great, solid Catholic friends (and even the non-Catholic friends I have are just really solid, child-loving people) so I sometimes start to forget that the mindset of the mainstream media isn't like that. But we are counter-cultural, and we must not forget the power of that! But all kidding aside, we went on to have a really great discussion with him. We found out that he had actually fallen away from the Church, and got him to open up about his reasoning just a little bit. It made me so sad, because it was kind of the typical story you hear - him not thinking he was "getting anything" out of Mass and whatnot. It broke my heart to know that, yet another person had fallen between the cracks of poor catechesis! He seems like a good man, and I am fervently praying that he comes home to the Church. In your charity, please keep Dave in your prayers. Have you ever had a Jehovah's witness come to your door? Here are some great tips for the next time that one comes knocking. I think an especially apt point that they make in the article is that it's fairly fruitless to argue theology or scripture with them. Trying to get to the heart of the matter is much more powerful. Our friend didn't falter a bit when we debated him - but he definitely was thrown off when I ask him if we could pray for him, and when Andrew asked him why he left the Church. Always, always look at these individuals as a person, created in the image of God, who are worthy of love - not like an opportunity for debate. The love will them wondering! I imagine we were a bit of an anomaly for him - this young Catholic couple with small children, going on about our love of the Eucharist, Mass, and Sacraments! But I hope that the love that radiated out - the love of our faith and our love for him - planted a seed or two. That was a long one! How about a short take. Here's a helpful guide from Auntie Leila, for all of you parents caring for sick little ones right now. I don't know if any of you have followed the story of beautiful little Meagan, but her mother had the most beautiful reflection this week on the importance of the life of her daughter and the lives of all of those with special needs. It is so perfect, and a great introduction to the misunderstandings these families and their children face. On a light note, Maria is at that fun stage where language is just clicking for her. One of her new phrases is, "Read it!" Her favorite book to read on repeat is Good Night, Gorilla. Thankfully, we have two copies or else I don't think the book would survive her toddlerhood. I did capture a video of her earlier this week, trying to read Jen Fulweiler's book, Something Other Than God. You can find that goodness, over on Instagram!! If you don't already follow Cam...you really must! 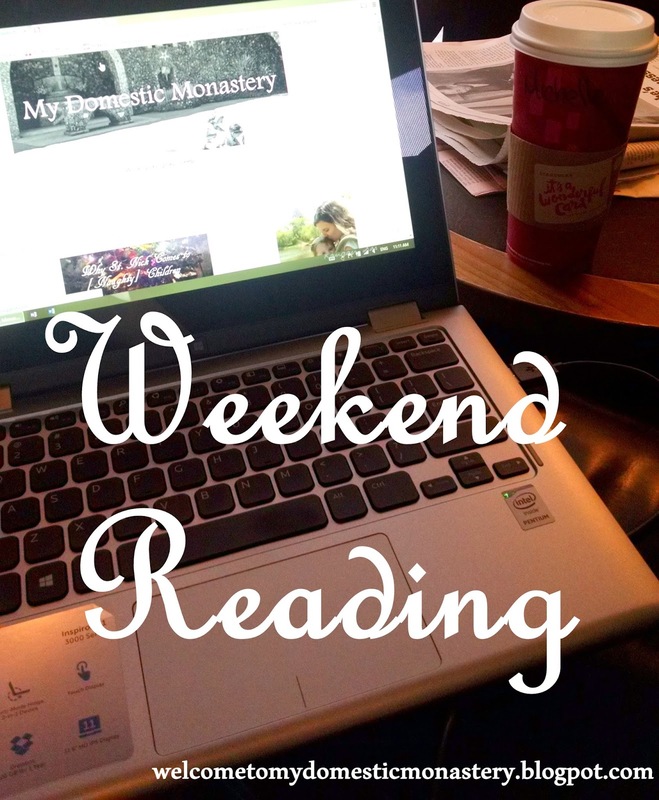 She is one of the unsung bloggers in the Catholic blogosphere, but her content is excellent! I could really relate to her post about consulting Dr. Google in the middle of the night. Linking up with Miss Sheenazing Kelly for 7 Quick Takes. Congrats, Kelly! !